The Lotka Volterra fishing problem looks for an optimal fishing strategy to be performed on a fixed time horizon to bring the biomasses of both predator as prey fish to a prescribed steady state. The problem was set up as a small-scale benchmark problem. The well known Lotka Volterra equations for a predator-prey system have been augmented by an additional linear term, relating to fishing by man. The control can be regarded both in a relaxed, as in a discrete manner, corresponding to a part of the fleet, or the full fishing fleet. 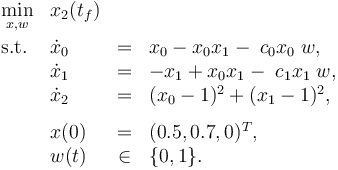 The mathematical equations form a small-scale ODE model. The interior point equality conditions fix the initial values of the differential states. The optimal integer control functions shows chattering behavior, making the Lotka Volterra fishing problem an ideal candidate for benchmarking of algorithms. Here the differential states describe the biomasses of prey and predator, respectively. The third differential state is used here to transform the objective, an integrated deviation, into the Mayer formulation . The decision, whether the fishing fleet is actually fishing at time is denoted by . These fixed values are used within the model. If the problem is relaxed, i.e., we demand that be in the continuous interval instead of the binary choice , the optimal solution can be determined by means of Pontryagins maximum principle. The optimal solution contains a singular arc, as can be seen in the plot of the optimal control. The two differential states and corresponding adjoint variables in the indirect approach are also displayed. A different approach to solving the relaxed problem is by using a direct method such as collocation or Bock's direct multiple shooting method. Optimal solutions for different control discretizations are also plotted in the leftmost figure. this is the best lower bound on the optimal value of the original problem with the integer restriction on the control function. In other words, this objective value can be approximated arbitrarily close, if the control only switches often enough between 0 and 1. As no optimal solution exists, two suboptimal ones are shown, one with only two switches and an objective function value of , and one with 56 switches and . Optimal relaxed control determined by an indirect approach and by a direct approach on different control discretization grids. Differential states and corresponding adjoint variables in the indirect approach. Control and differential states with only two switches. Control and differential states with 56 switches. different parameters and start values.
. These are also the references to look for more details.